As the online food delivery firm Deliveroo backtracks in a row which has seen its drivers in London protest a new pay scheme, PR professionals assess the reputational damage - and whether these problems are becoming too common for today's startups. Deliveroo has apologised after facing protests by its London couriers over changes to pay terms that riders said would significantly reduce their earnings. Deliveroo had announced the trial scheme would pay them for each delivery rather than an hourly rate, although riders could choose to stick with the terms of the old plan. The debate over flexible working and whether it allows companies to become more exploitative has grown hand-in-hand with the sharing economy – Uber, for example, regularly comes under scrutiny for how it treats its drivers. But not only does the incident raise questions over whether Deliveroo will suffer lasting reputational damage, it also draws attention to whether reputational missteps are easier to come by as a rapidly growing startup. Max Tatton-Brown, founder of comms agency Augur, previously worked at b2b tech startup Tradeshift, and knows some of the challenges well. "Startups are always pushing at the margins of legislation and operating principles to carve an advantage," he told PRWeek. "But when they find themselves under the spotlight, they have an ‘unbuyable’ opportunity to define their market and the narrative for the public eye." He added: "Deliveroo has put out a basic enough response to de-fang the immediate threat of the story. But in parallel, it got to tell the BBC Today programme listeners about the food truck owner outside its office who also makes deliveries in the evening. And now you’re reading it here." Mark Terry-Lush, the co-founder and MD of comms consultancy The Honey Partnership, agrees. "A startup’s rapid growth often means it does not have the experience in dealing with these issues and it suddenly finds itself having gone from being a small company operating under the radar into a big media-facing company, with a large set of stakeholders," he pointed out. Terry-Lush said: "It can be difficult to adjust. As long as it holds its hands up and learns from it, people recognise that entrepreneurial spirit. It’s when they start to build an image as a big corporate taking advantage of the little guy that they have a problem." 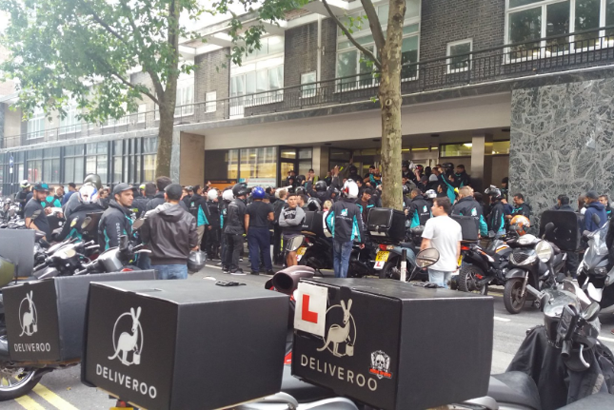 But PRs emphasise that Deliveroo will need to learn from this incident – and continuing protests by drivers over the terms of the pay concessions indicate this is not going to blow over just yet. The Hoffman Agency’s Europe MD Mike Sottak said that even with the company’s growing stature – raising $275m (£212m) in a recent round of investment to fuel its global expansion – it could not afford to be complacent. He commented: "Fair wages and good working conditions are issues that strike home for consumers of all types. So if there is even a hint of unfair practices, there is a strong risk of them opting to not do business with anyone they perceive as not treating their workers well." Sottak added: "In fairness to Deliveroo, it seems to have taken a very proactive and transparent communications approach on this issue." CEO William Shu has been front and centre in responding to the row, apologising for allowing the dispute to escalate, after the government stepped in at the weekend. The Department for Business, Energy and Industrial Strategy intervened on Sunday to say that workers must be paid the national living wage of £7.20 an hour, unless a court or HMRC ruled that they were self-employed. "I’m very sorry things have gone to this point. Our riders are the life blood of our business and without them we are nothing," Shu told the BBC’s Today programme on Monday. "This [the prospective pay plan] is in response to our riders’ number one concern which is flexibility," he added. "This was a choice for them. If the riders choose to be on a new scheme, that is great. If riders feel like it’s not for them, they can choose to work on the old scheme as well." Deliveroo told PRWeek the current focus for the firm was maintaining an open dialogue with riders and correcting misinformation that has been spread. Ultimately, Terry-Lush thinks this will be a case of lesson learned for next time, rather than a longer-lasting reputational issue. "If the product works and lives up to customer expectations in the long term, everyone will forget a speed bump," he said.